At least 24 Egyptian policemen have been killed in an ambush attack in the Sinai peninsula. Medical sources and officials said the police were in two buses which came under attack from armed men close to the town of Rafah on the Gaza border. Three policemen were also reported to have been injured in the blast. The military recently intensified a crackdown against militants in Sinai, where attacks have surged since the fall of Hosni Mubarak in 2011. Egyptian deployments in the peninsula are subject to the 1979 peace treaty between Israel and Egypt. There were conflicting reports about how Monday’s attack unfolded. Security sources quoted by the Associated Press news agency say four armed men stopped the buses and forced the police to get out before shooting them. But other reports spoke of rocket-propelled grenades being fired at the buses. The Rafah border post into Gaza was closed in response to the attack and security increased at checkpoints on the peninsula. 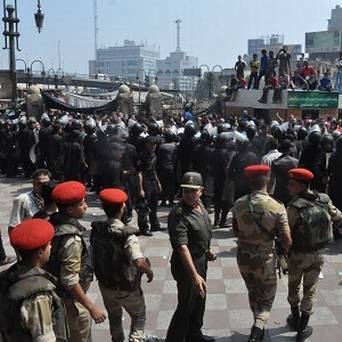 Egypt’s interim, military-backed leaders have declared a state of emergency amid the nationwide unrest which has followed the ousting of Islamist Mohamed Morsi as president on 3 July. A night-time curfew is in place in the capital, Cairo, and many other provinces. More than 830 people, including 70 police and soldiers, are reported to have been killed since Wednesday, when the army cleared protest camps set up by Mohamed Morsi supporters, many of them members of the Muslim Brotherhood movement. On Sunday night, 36 Islamists died as they were being transported to a prison outside Cairo. Government and military officials said they had suffocated in the back of a prison van from the effects of tear gas, which was fired when the prisoners rioted. But there were other reports of gunfire. The Brotherhood said the interior ministry had “decided to betray its trust and ignore its role” and had killed the detainees “for their opposition to the bloody military council”. It said the “heinous crime shows the total disregard of the right to life by these murderous fascist thugs” and raised concerns about the safety of the hundreds of pro-Morsi activists now in detention. European Union foreign ministers are to hold emergency talks on Wednesday to discuss the situation in Egypt. The date was agreed during preparatory talks by senior diplomats in Brussels on Monday. European Commission President Jose Manuel Barroso and the president of the European Council Herman Van Rompuy have said the EU “will urgently review in the coming days its relations with Egypt”. In a joint statement on Sunday, they expressed regret that international efforts to find a peaceful way forward in Egypt were abandoned and a “course of confrontation” instead pursued. “The calls for democracy and fundamental freedoms from the Egyptian population cannot be disregarded, much less washed away in blood,” they said. Mohamed Morsi’s supporters say the removal of Egypt’s first freely elected president was a coup. However the interim government says the Muslim Brotherhood has carried out a campaign of terror since he was overthrown. The head of the armed forces, Gen Abdul Fattah al-Sisi, has warned the military will not tolerate unrest. Meanwhile, a lawyer for Hosni Mubarak has said he expects the former leader to be released from prison within the next two days. However, the legal situation is unclear. Hosni Mubarak is facing a retrial for corruption and complicity in the deaths of protesters during the 2011 uprising.